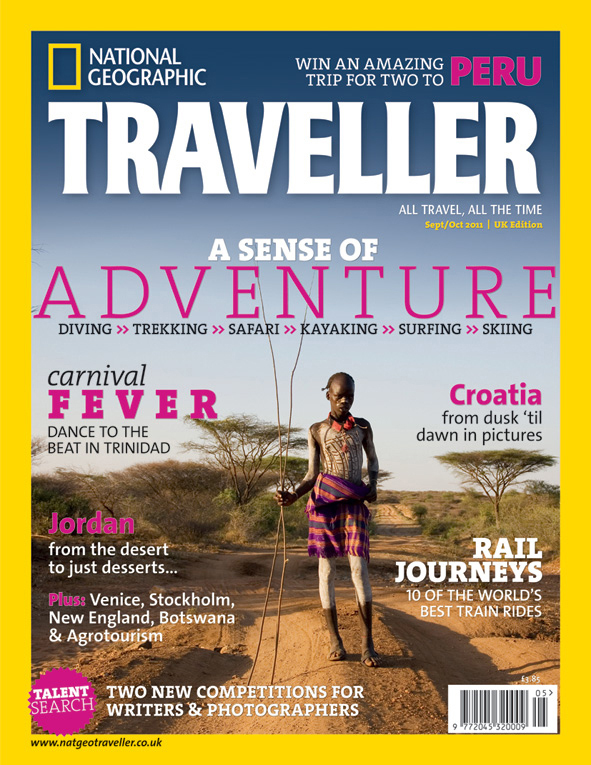 LONDON (12 August 2011) — The fifth issue of the 180-page National Geographic Traveller (UK) Sept/Oct 2011 issue, is now available on the newsstands, once again packed full of real life traveller tales and destination inspiration for you to read — and get up and go. Cover Story: Spirit of Adventure — The best of adventure travel as we climb Mount Everest, dive in the Cayman Islands, take an Amazon cruise and indulge in Swedish wintersports as well as a whole lot more in our cover story. Destinations — far & away: Forget Notting Hill Carnival — head to Trinidad for the ‘real thing’. Take a safari trip to Botswana and see its wildlife up close and personal. And discover the beauty of New England in the ‘Fall’. Destinations — closer to home: From eco-lodges and cuisine to the warmth of its welcoming people, Jordan never fails to amaze. See Croatia by day and night in our spectacular photo-feature. And track down 10 of the world’s greatest train journeys. Smart Traveller: Live like a local in Beijing, explore the exciting cuisine of Brazil and discover our top choices for London hotels. Interview: An insight into Moby’s many talents as he combines photography and music in his latest project. Travel Talk: Ask the experts about your travel dilemmas; what you can do to avoid data roaming fees, the best stopover options going Down Under and the lowdown on data roaming fees. Real Life: The growing trend of agrotourism explored and volunteer tourism at an orphanage in Thailand leads readers to find out about the launch of our own Young Travel Writers Competition (see below). •	Subscription gift: GBP 9.99 for six issues – and a free gift (a rucksack/across the body bag) while stocks last. Don’t miss out. •	Distribution for Sept/Oct: Marks & Spencer – 100 London stores; Waitrose recommended read in over 130 stores; Sainsbury’s promotion in over 300 stores. Plus all the usual newsstand distribution (including WH Smiths and independents). •	If you can’t find the magazine – let the team know today! National Geographic Traveller (UK) is published six times a year, with a cover price of GBP 3.85, via subscription and on newsstands. Visit www.natgeotraveller.co.uk for more information. Tel: +44 (0) 20 7253 9009. This press release was distributed by ResponseSource Press Release Wire on behalf of APL Media (Absolute Publishing) in the following categories: Men's Interest, Entertainment & Arts, Leisure & Hobbies, Travel, Media & Marketing, for more information visit https://pressreleasewire.responsesource.com/about.